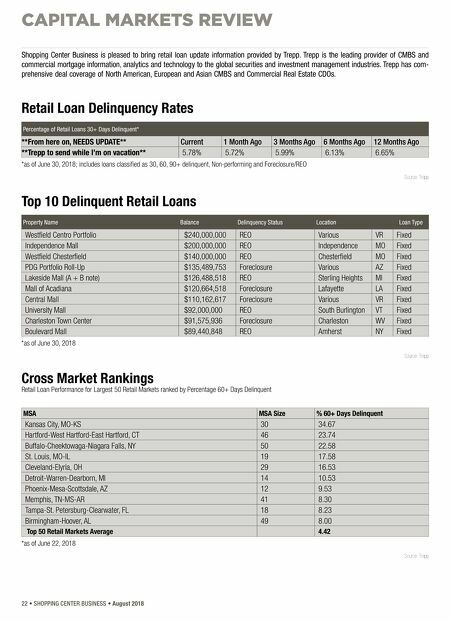 CAPITAL MARKETS REVIEW August 2018 • SHOPPING CENTER BUSINESS • 23 Cross Market Rankings Retail Loan Performance for Largest 50 Retail Markets ranked by Percentage — Debt Service Coverage Ratio <1 MSA Size MSA % DSCR <1 29 Cleveland-Elyria, OH 14.52 50 Buffalo-Cheektowaga-Niagara Falls, NY 14.35 46 Hartford-West Hartford-East Hartford, CT 13.76 19 St. Louis, MO-IL 12.63 20 Baltimore-Columbia-Towson, MD 8.19 14 Detroit-Warren-Dearborn, MI 8.19 13 Riverside-San Bernardino-Ontario, CA 5.86 41 Memphis, TN-MS-AR 5.82 6 Philadelphia-Camden-Wilmington, PA-NJ-DE-MD 4.69 31 Las Vegas-Henderson-Paradise, NV 3.93 Top 50 Retail Markets Average 2.74 *as of July 17, 2018 Source: Trepp Shopping Center Business is pleased to bring retail loan update information provided by Trepp. Trepp is the leading provider of CMBS and commercial mortgage information, analytics and technology to the global securities and investment management industries. Trepp has com- prehensive deal coverage of North American, European and Asian CMBS and Commercial Real Estate CDOs. 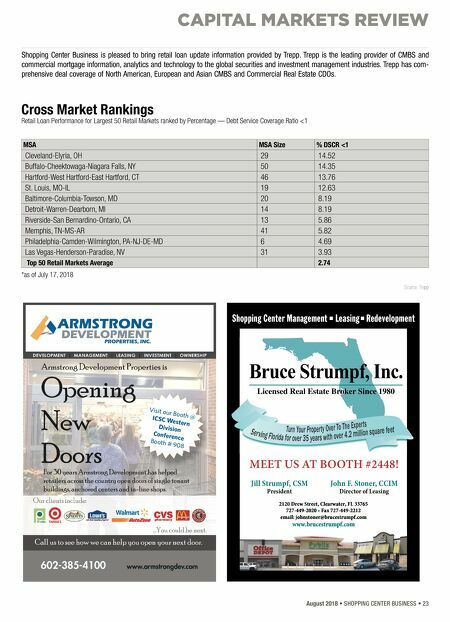 Visit our Booth @ ICSC Western Division Conference Booth # 908 Shopping Center Management n Leasing n Redevelopment Bruce Strumpf, Inc. 2120 Drew Street, Clearwater, FL 33765 727-449-2020 • Fax 727-449-2212 email: johnstoner@brucestrumpf.com www.brucestrumpf.com T u r n Y o u r P r o p e r t y O v e r T o T h e E x p e r t s S e r v i n g F l o r i d a f o r o v e r 3 5 y e a r s w i t h o v e r 4 . 2 m i l l i o n s q u a r e f e e t 2120 Drew Street, Clearwater, FL 33765 727-449-2020 • Fax 727-449-2212 email: johnstoner@brucestrumpf.com www.brucestrumpf.com Jill Strumpf, CSM President John F. Stoner, CCIM Director of Leasing MEET US AT BOOTH #2448!